...that China has banned The DaVinci Code? Or that it's been similarly nixed in some Muslim countries? I mean, what's their beef with it anyway? A 56-foot long bronze bas relief tribute to the firefighters who perished as a result of the September 11, 2001 attacks on the World Trade Center has been unveiled in New York City. The Times has the story. Be sure to click on the multimedia interactive feature while there. It seems an appropriately epic tribute to genuine heroes. God didn’t put me on earth just to fulfill a to-do list. He’s more interested in what I am than what I do. That’s why we’re called human beings, not human doings. Happy moments, PRAISE GOD. Difficult moments, SEEK GOD. Quiet moments, WORSHIP GOD. Painful moments, TRUST GOD. Every moment, THANK GOD. "It's the missing that counts"
Richard's microfiction hero gets romantically nostalgic in the grocery store. Go, take a listen. (Thanks to Tamar for linking to this beautiful piece of musicianship.) Interestingly, George Harrison often composed songs on his ukulele. John Schroeder of Blogotional is conducting a poll to determine the level of comfort that credal Christians might have with voting for a Mormon candidate for President in 2008. Of course, the most prominently mentioned name is that of Massachusetts Governor Mitt Romney, whose father's bid for the GOP nomination in 1968 ended spectacularly over his "I was brainwashed" gaffe. Go here to participate in John's poll. Mathematician, philosopher, and atheist Bertrand Russell was fond of dismissing the Ten Commandments with the simple observation that they're actually composed of more than ten commandments. While Russell was correct, that's no basis for dismissing them. We've come to call them The Ten Commandments because of how they appear in a pre-Christian Greek translation of the Old Testament generated in the city of Alexandria, called The Septuagint. There, these commands are referred to as the deka logoi, the ten words or the ten sentences. In The Small Catechism, written for use by families at the dinner table, Martin Luther treats the Ninth and Tenth Commandments separately. Not so in The Large Catechism, which he penned for pastors and theologians. There, they're treated together. And rightly so. You shall not covet your neighbor's wife, or his manservant, or his maidservant, or his cattle, or anything that is your neighbor's. The intent of this command, whether rendered as one or two different ones, is clear. In the preceding commands, God has warned us against actions we might take that would do harm to others. Here, God addresses the attitudes that lead to such actions. To covet is to desire something that isn't rightfully ours, be it the affections of another's spouse or their possessions. Luther pointed out that in ancient times, obtaining a divorce for the flimsiest of reasons was even easier than it is today. In both the Old Testament world of the Hebrews and the New Testament world of the Roman Empire, a husband could simply decided to dismiss a wife and then be free to entice another man's spouse to become his wife. This command was designed to thwart that sort of behavior. More on how that all works in the next installment of this series, I hope. Her current prominence probably says something [both] about her and about our country. Today I have to say that I still feel sorry for her. But her increasingly shrill and nasty statements make her less than likable. Many conservatives tell me that she's an embarrassment and they wish that she would just be quiet and go away. Politics is a full-body-contact sport, to be sure. But Coulter has crossed a line with her new assertions about the 9/11 widows. But give Coulter credit: Like Morgana the Kissing Bandit, she's getting precisely what she wants from her outrageous statements: attention. That, in turn, will no doubt lead to book sales. By now, Ann Coulter is like the three-car crack-up on the Interstate: You don't want to look, but what's before you is so gruesome, so outrageous, you can't help but look. UPDATE: Michelle Malkin is trying to legitimize Coulter's 9/11 comments saying that the author is "antagonizing the Left with her comments about the liberal 9/11 widows." It isn't just the left who is likely to be antagonized by Coulter's comments. People on the right, evangelical Christians, and people who believe in civility are all likely to be antagonized by them. I know because I'm on the right politically, I'm an evangelical Christian, and I believe in civility in our public discourse and I think that Coulter's statements are indefensible! It's perfectly legitimate for people to disagree with the four widows that Coulter attacks. But to say that the women are enjoying their widowhood or to suggest, as she did today, that their four husbands may well have been contemplating divorcing them, is savage and insulting. If there is a God, do you think there's a chance in Hell that he smiles on your superstitiousness? I've no doubt there is a God and that maybe Ann could have found a better way to ask her question. But I couldn't agree more with the sentiment behind it. In the Gospel of John, eight, as in "eight days later" or "on the eighth day" represents the new creation that issues from Jesus' resurrection for all with faith in Him. The eighth day is God giving all creation another chance at wholeness, a state of being marred by the condition of sin. Six, because of the same Genesis account, sometimes represented incompletion or even alienation from God. It represented being not to Sabbath rest or the new creation. Most interpretations of the New Testament book of Revelation are hogwash that pay no attention to its historical context or the fact that it's a "Johannine" document, its authorship attributed to John the Evangelist, who employed a rich mixture of Hebrew and Greek images and philosophical ideas in his writing. 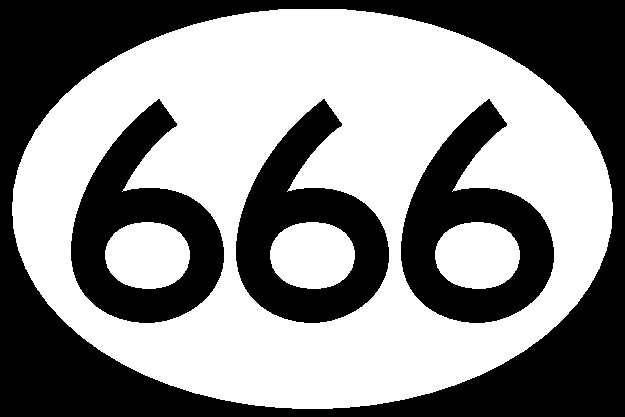 Many ancient texts have the number in Revelation as "616" anyway. But whether that or "666" is irrelevant. Numerology isn't Biblical or Christian. On Sunday, I cited Proverbs 3:5, which says, "Trust in the Lord with all your heart..." People who spin fanciful and unfaithful scenarios from the Bible based on numerology are guilty not only of enthroning superstitions as their gods, but also of making idols of their own intellects. It's too bad that they scare the credulous. But then, nobody ever went broke mocking God. I'm spending my June 6 undergoing a surgical procedure at the periodontist's office. However it turns out, I'm trusting God, no matter the day on our Roman calendar. There will be no posting here for the next several days. I'll be undergoing a soft tissue graft and will likely be even loopier than usual. My family could also use your prayers these days, details of which I may never reveal here, but which I certainly cannot discuss until at least mid-July. I wrote earlier about Mike Smith, the Dave Clark Five keyboardist who was paralyzed by a fall suffered some three years ago. Here's more info. I don't usually remember dreams. This one I did. In it, I found myself walking through Paul Simon's house in New York City. How I knew whose house I was in or even if Simon actually still has a house in NYC, I don't know. I remember it being white stucco with wood framing, like something you might see in the Italian or French countrysides, a villa. It was two-stories tall, large but not ostentacious. Somehow, as I walked inside the house, the Simon-connection ended and instead, I found myself in the offices of ESPN, the sports TV and radio network now owned by Disney. I clambered up some winding, plain stairs that looked to be made from oak, beautiful but flat in tone, not coated with shellac. I walked into a room and found four sports journalists at a table, each wearing headphones, none of whom I recognized. Three were men, one was a woman. On seeing them, I realized that I was not walking through a house any longer. I was somehow in the archives of the ESPN web site. Everything around me was digitized information that looked like real life, a la Tron, except that nobody was trying to off me. I was in fact, as irrelevant as anyone who logs onto a web site and reads an article or views a video. I was a consumer. It was like being present, but not part of, some historical events about which you read often; no matter how vividly you imagine it or "see" it, you aren't part of it and you can't change it. It's a done-deal, a dead moment. The journalists were talking about what was likely to happen in sports in the Year 2002. They were presenting a preview of a year that's four years gone. Everything they said, I'd heard them say already. I'd been seated, listening to the four journalists for a short time, when I realized that I could almost mouth every word they said as they said them, like Bill Murray in Groundhog Day. So, I stood up and said, "Excuse me." They turned to me, not saying a word. It was like clicking pause when you watch video streaming. "I've heard all of this before. So, I'm going to leave." When I did that, I woke up. Most of the time, when I dream--at least in those dreams I remember--if I come to a spot that I don't like, I'll just think, "I don't like this dream. I'd better move on to something else." I just switch channels to something I want to dream or think about. But I've never had a virtual world dream before. I seem to have moved from television-like dreams, complete with a remote control, to digital ones. Has the Digital Age changed the way you dream? We come now to a consideration of The Eighth Commandment: You shall not bear false witness against your neighbor. "Besides our own body, our wife or husband, and our temporal property," Martin Luther writes in The Large Catechism, "we have one more treasure which is indispensable to us, namely, our honor and good name, for it is intolerable to live among men in public disgrace and contempt." It's to spare us such disgrace and contempt that God gives this commandment. There's good reason for this: Persons with positive reputations are more able to live useful, productive lives, which is something that God wants all of us to experience. When we take people's reputations from them, we not only harm them, we obstruct the plans of God for their lives...and our own. Some of the worst trouble I've experienced in my life and some of the worst damage I've done in this world have stemmed from my words. I've also seen the damaged reputations caused by others' careless words. Years ago, there was a prominent person in the community where I lived at the time, a leader who struggled to introduce changes and who experienced some successes. Although I agreed with the lion's share of what he tried to do, I also sometimes winced at the pace and recklessness with which he went about his work. He began to experience major opposition and found himself no longer able to lead. Soon thereafter, he resigned his position and went to another community, where happily, he was very successful. Not long after he left, I was at a ball game and it was halftime. I overheard some people talking about this man. "I heard he took off with a lot of money," one guy said. Not even this man's worst enemies accused him of financial dishonesty. Yet, here was a guy pushing a tale that, with no foundation in fact, nonetheless hurt someone's reputation. I will always regret that I didn't more forcefully defend the maligned man. No one shall harm his neighbor, whether friend or foe, with his tongue. No one shall speak evil of him, whether truly or falsely, unless it is done with proper authority [judges and preachers are among those Luther claims to have this authority] or for his improvement. A person should use his tongue to speak only good of everyone, to cover his neighbor's sins and infirmities, to overlook them, and to cloak and veil them with his own honor. God cares about our reputations because God cares about us. True story as told by the late Bill Bright, a Christian leader: During the Great Depression, there was a man named Yates who owned a Texas sheep ranch. But it wasn’t a profitable venture at all. Yates was unable to make enough to pay on either the principle or the interest on his mortgage. He and his family were forced to live on a government subsidy, daily facing the possibility of foreclosure. Then one day a seismographic crew from an oil company told Yates that there might be oil on his land. They asked for permission to drill for oil. Yates signed a contract letting them do that. Some 1115 feet underground, they struck an enormous oil reserve! For a long time, that first well produced 80,000 barrels a day. Yates owned every bit of it. “The day he purchased the land he...received the oil and mineral rights. Yet, he’d been living on relief. A multimillionaire living in poverty. The problem? He didn’t know the oil was there even though he owned it.” He had no notion of what he already had! Today is Pentecost, one of the three great festival days of the Church Year. On it, we remember a strange event that happened ten days after the risen Jesus ascended to heaven. After Jesus rose from the dead on Easter, He spent forty days with His followers, forgiving them of their sins, shoring up His teaching, preparing them for their future lives without Him, and readying them to be His witnesses. Jesus, according to Paul, spent time with about 500 of His disciples during this period. 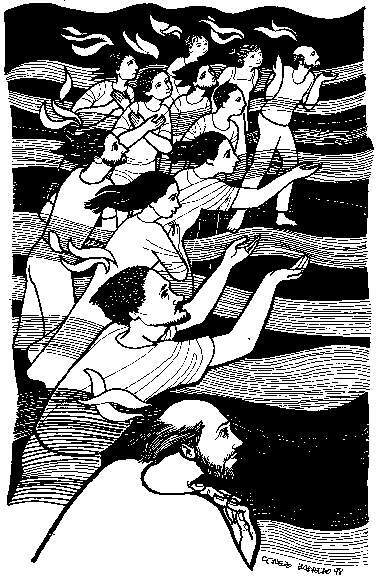 Just before He ascended to heaven, Jesus told them to go back into Jerusalem and pray: He would send the Holy Spirit to them. The Spirit would make it possible for them and others to believe the Good News that when people surrender to Him, their sins are forgiven and they have life forever with God. So, they prayed. And prayed. And prayed some more. There were still about 120 of them praying when Pentecost rolled along. The Holy Spirit had come to that humble crowd of believers in Jesus. So, what does this strange incident tell us? First of all, it tells us that through the Holy Spirit, the risen Jesus can be with us now. Our faith is not about some old events that happened to a bunch of people wearing bath robes back in the first-century. We can experience Jesus’ presence in the present. This is especially important for our three confirmands--Heather, Cori, and Laura--to remember today. There are many people in this sanctuary today who can talk about how in difficult and challenging times in their lives, they knew that the Holy Spirit helped them experience the presence of Jesus. They could also talk about how in the mountaintop experiences of their lives, they knew that presence too. When my wife was three-and-a-half months pregnant for our first child, our son, she suffered from an appendicitis. During the wee hours of Palm Sunday, 1981, she underwent surgery and I and a lot of family members and church friends, prayed like crazy for her and our baby. In the midst of that praying, I sensed God’s presence. The doctor told us that five years before my wife's appendicitis attack, we would have lost our son and that ten years before, I would have lost both of them. When I preached at the sunrise service at our home church on Easter Sunday one week after my wife’s surgery--and with her in the sanctuary, you can bet I also sensed the presence of the God into Whose hands I had placed her, our son, and myself. Many times, I’ve experienced the presence of God’s Holy Spirit when I visit people who are dying or those who are grieving. In those circumstances, I still don’t know what to say or do. But then I pray: I ask God to guide me, to give me the right words and the right silences. Every time I’ve done that, God has empowered me for those moments. I’ve learned that Jesus is good for the promise He made to those who dare to follow Him just before He ascended to heaven: “I am with you always, even to the close of the age.” Through the Spirit He sends to His followers, He is constantly present. But that brings up a second thing that the Holy Spirit did on that first Pentecost: He made it possible for people who had once been afraid that they might be crucified if they just whispered the Name of Jesus to tell the whole world about Him. An old song by the Christian rock band, Newsboys, says, “God is not a secret to be kept.” That’s true. But a lot of times we Christians act as though we belonged to some secret society. Wrong! Our call as followers of Jesus is to help the whole world know that they can experience Jesus’ presence in their present. Years ago, a man called me. I’d met him through a group in the community, but didn’t know him well. He asked if we could meet at a local restaurant. He needed to talk. He knew that something was missing in his life and sensed that it might be God. He asked me some questions about Jesus. I prayed that God would give me the right words. To my astonishment and delight, we prayed together in that restaurant and he gave his life to Jesus Christ. He joined the church to which his family belonged and has been an active Christian ever since. For as long as I live, I won’t forget the sense of the Holy Spirit’s presence as we prayed together. And even today, I see God in the way that man is living his life. It's an awesome thing! Maybe not. But Jesus has called you and me to be witnesses, telling and showing others His love. “You will be my witnesses,” Jesus tells us. He states it as a matter of fact; the only question is whether we're going to be good witnesses or bad ones. To paraphrase Rick Warren, the church that isn’t interested in sharing Christ with others is really telling the world to go to hell. I don't want to be part of that sort of church or to be that kind of Christian! Once Jesus Christ has come into your life--once you’ve experienced the presence of God in the present, it’s unthinkable that you wouldn’t love your neighbor enough to tell them about Christ! But what’s really interesting is that the more we share Christ with others, the more present He becomes to us, too. As I helped that man surrender his life to Jesus in the restaurant, he wasn’t the only one who sensed God wrapping His arms of compassion and promised around his life. He embraced us both! For Heather, Cori, and Laura and all of us, this can be a moment like the one experienced by the three-thousand people who came to faith in Jesus on the first Pentecost or like that man. The presence of God can be a present reality for you. The presence of God can make it possible for you to give the life that Jesus offers to your friends and family members. In closing, let me tell you that this can be a time when faith may be kindled in some for the first time or when faith can be renewed. It’s a simple matter of rejecting sin and of asking Jesus Christ to be at the center of our lives today and every day. The Spirit can be present in your present. He wants to be. The question is: Will you let Him be? Today, in response to the love and new life God gives through Jesus Christ, let your answer be Yes! "Yes, Lord, be present in our present all the way to eternity!"